Home crowd at Pink Arrow Pride IV in Lowell, Michigan in 2011. With my recent travel and the 4th of July holiday, I missed the resignation of one of America’s top coaches — Noel Dean of Lowell High School in Michigan. Dean, a member of the Michigan High School Football Coaches Hall of Fame, led the Red Arrows to three state championships while amassing a lifetime record of 219-41. In addition, Dean guided Lowell to 10 league titles, 11 district titles and 8 regional titles. In addition to the three state titles, Dean led the school to three state runner-up finishes. But, maybe more than the on the field success, Dean is best known for his creation of the school’s Pink Arrow Pride game in 2008 that raised $1.8 million to help community residents in their battle with cancer. In 2011, Lowell head coach Noel Dean was joined by Pacqui Kelly, cancer survivor and wife of Notre Dame head coach Brian Kelly for a seminar for other schools on how to hold a fundraiser. 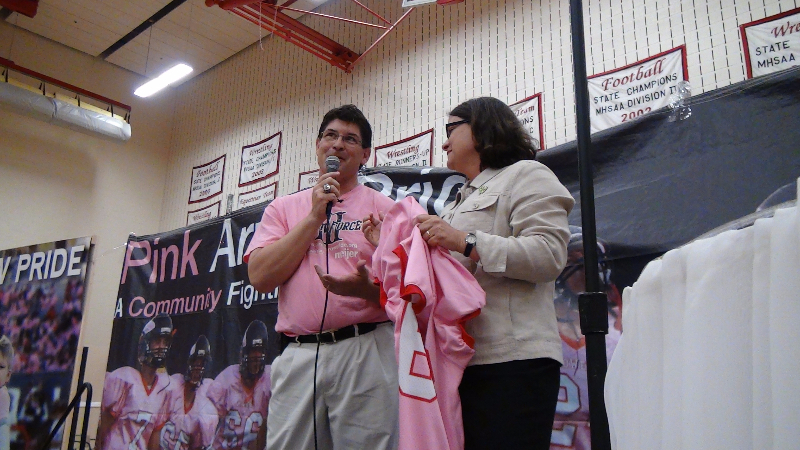 High School Football America attended Pink Arrow Pride III and IV in 2010 and 2011. Quite honestly, in my forty-plus years of covering high school football, I’ve never attended a better high school event. Wednesday, Lowell promoted defensive coordinator Juston Miller to the position of head coach. Pink Arrow Pride XI will be played August 30 against Rockford (Michigan).